Atco has informed the community that they will not begin road building until 2019. Final maps of cut block R10 are posted below, with the area for the Elk Wallow being enlarged to 2ha. Final Site Plans are below. The aqua blue line is the approximate watershed boundary. 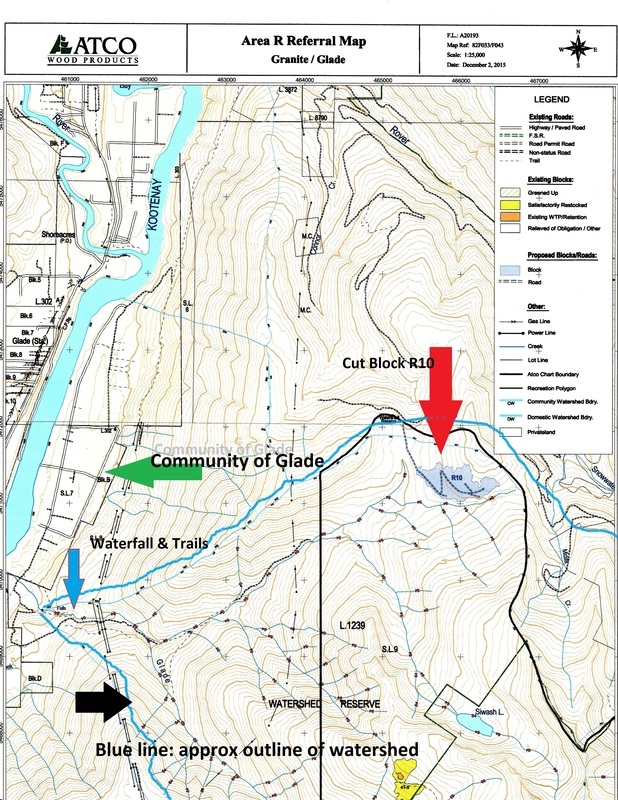 All blocks are within the watershed boundary and between the dark blue South Fork tributary the goes into Glade Creek. The road originates from the Bombi Pass and goes through Erie Creek/ Granite area that is heavily logged with more to come. 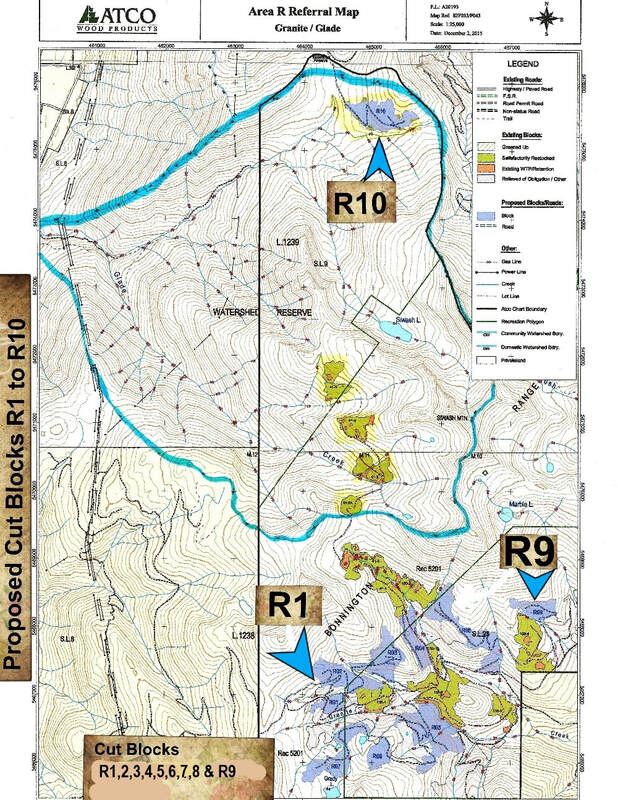 Cut block R10 is located in our watershed in the north east. 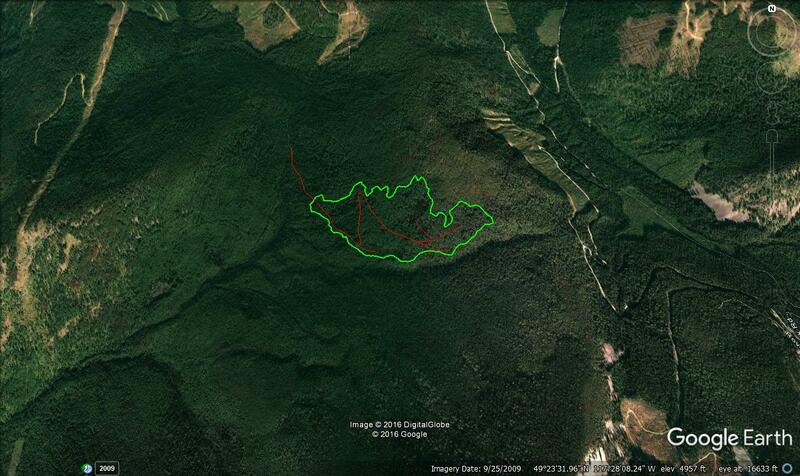 Cut block R10 will be the first of many clear cut blocks in the Glade watershed. It is located, according to the map provided, nestled between and above North Glade Creek and another unnamed creek that feed into the north fork tributary which in turn leads to Glade Irrigation District's water intake lower down. Behind the Glade watershed is Blewett watershed area. There has been extensive logging and road building throughout the Blewett watershed. The proposed road to block R10 will allow greater access into our watershed from the Rover Creek/ Blewett ATV area. To the right is a map referencing cut block R10 in our watershed. 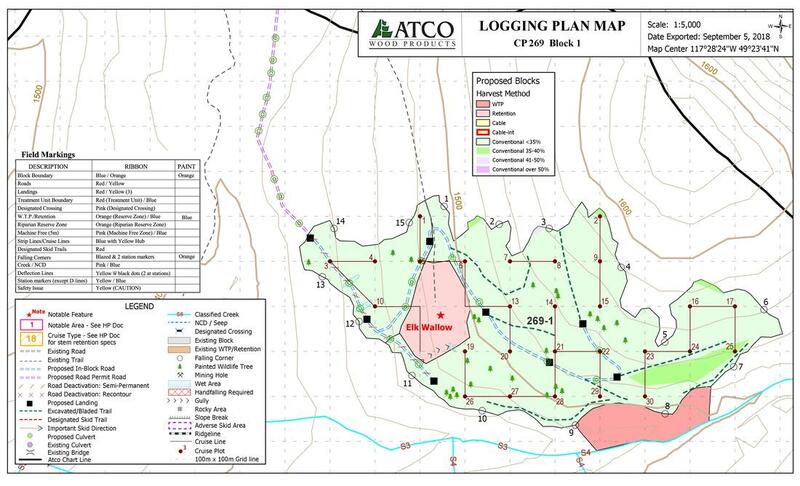 In 2000 to 2001, ATCO logged 4 cut blocks in the south-east of Glade watershed. One of their cut blocks is shown as a yellow area at the bottom of the map. 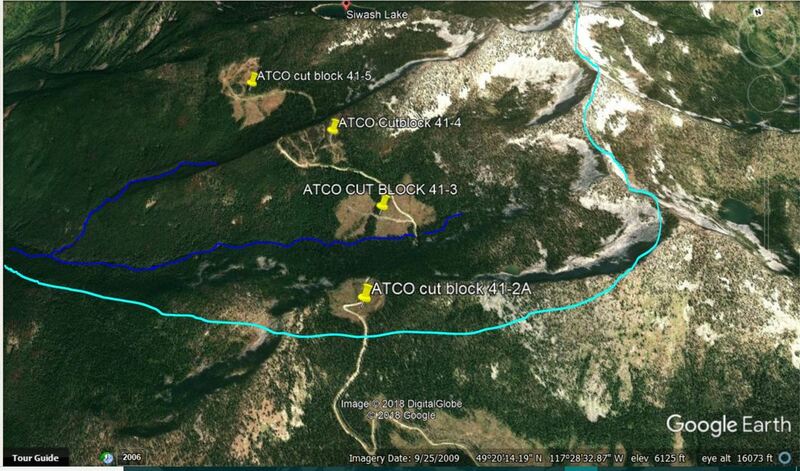 Google Earth image provided by ATCO showing the proposed cut block r10. Notice the deep green forest cover in the Glade watershed. Surrounding the watershed to the top and right are clear cuts and roads already made by Kalesnikoff Lumber Company in Rover Creek area. The red lines are planned roads. 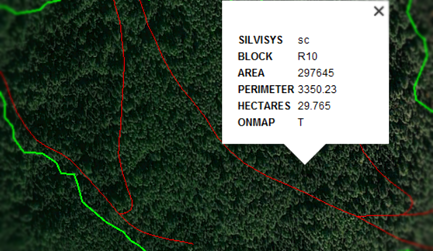 Close up of the area shows the density and green of the intact forest that ATCO wants to log. ATCO's cutting boundaries shown with a wider black line. The arbitrary straight edge on the left is where it meets Kalesnikoff's boundary. Cutblock R10 is shown (pale purple) in the NE part of the watershed. 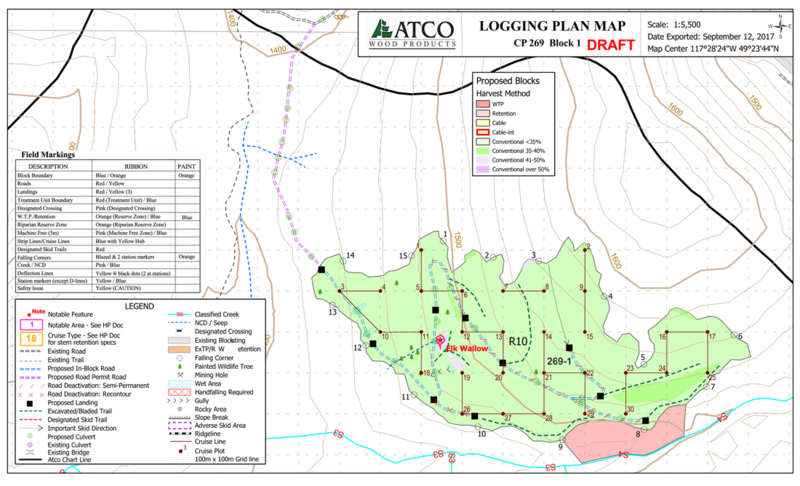 ATCO 5 YEAR FOREST STEWARDSHIP PLAN 2017..."...undertake to comply..."
This map shows all currently proposed cut blocks R1, R2, R3, R4, R5, R6, R7, R8, R9 and R10. As mentioned above, Cut block R10 is in the Glade Creek watershed, the other 9 are in Granite Creek, a tributary of Erie Creek. Access to these are from the Bombi summit on Hwy 3. There are 4 blocks within our watershed that were previously logged 1999-2000 (41-2A, 41-3, 41-4, and 41-5), shown in green.